Aloha everyone! This morning we bring a race report from the beautiful island of Oahu. 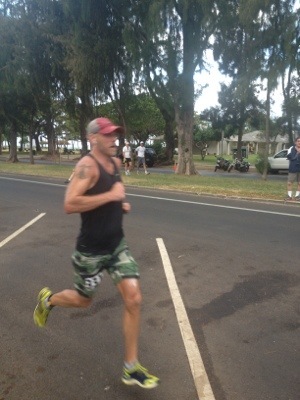 Michael finished in fourth place at the local Hibiscus Half Marathon. He came in 87 seconds faster than he did last year. Congrats to all runners completing 5 mi, 15k and the half marathon courses this morning and raising money for the Leukemia and Lymphoma Society. Great Job Dr.! Keep up the great work! Thanks! Hope all is well out in MD! I also hope you are still getting after it with Crossfit! Thanks Carl! I did not really expect that much out of the race and it turned out to be a pretty darn good day. I hope all is going well. Just peaked at the results. Dude, you were flying! You are getting seriously fast. Thanks! I went into the race just wanting to get in a solid effort and it turned out to be a good day. Hope all is well. I will try to get a full race report up in the next few days. Thanks. Seems like I am starting to make a little progress. I am 99% sure I will be out for Skyline 50k. Just waiting on airfare to drop a little. I will let you know as soon as I sign up. Hope training is going well!